Typically in Bamboo, your build plans are configured to be automatically triggered when code changes are committed to the working repository, or according to a schedule. The plan should only ever be run manually. You want to choose the revision of the default repository that should be used for the build. You want to run a customized build, so as to override global variables or plan variables. You want to select particular manual stages to run. You want the plan to be triggered by other plans that build successfully first. This page describes how to run a plan build manually, and the options available when running a customized plan build. Locate the relevant plan on the Dashboard. Click the Run icon for the plan. Alternatively, if you are viewing the plan, simply click the Run menu. Choose the revision of the default repository that should be used. Override any global variables or plan variables with your own parameters when triggering a build manually. This is referred to as running a 'parameterized plan build'. Select which manual stages to run, if manual stages have been configured for the plan. Click the plan name to go to the Plan Summary. Choose Run > Run Customized. 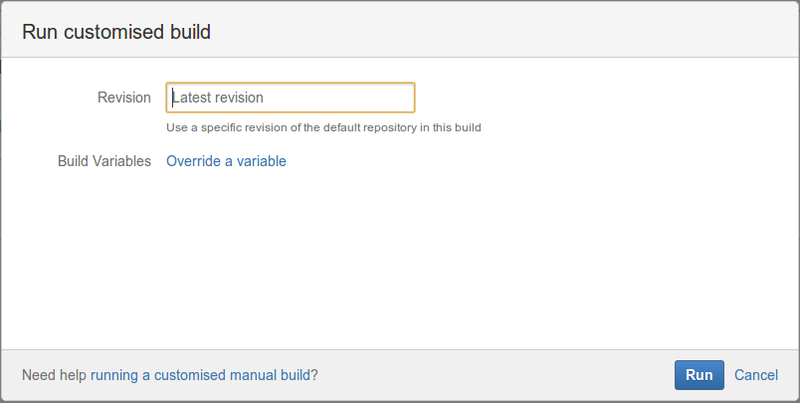 Choose a repository revision to use for the build. You can only choose revisions from the default repository. The build is not included in plan statistics or telemetry. version and cannot be fixed at a specific revision. Build Variables Click Override a variable to choose another variable to override. ステージ Choose the stages that should be run.